Some of my dearest memories from childhood are of playing outside with my siblings and neighbors. We played backyard baseball and tag, hunted lightning bugs and trapped turtles, jumped rope and climbed trees. And of course, we loved to swing. We had a very simple, old, metal swing set that I can still picture fondly with faded yellow and green stripes and a tiny attached slide. The way the four of us played with it, it’s a miracle it even held together. Then something very exciting happened. Our family entered a drawing for a beautiful Rainbow swing set at a home show. I am sure my parents entered other contests at the event, but you can imagine our joy when they drew our name for the swing set. We couldn’t believe it! Now we had higher, stronger swings, a tall wood platform and a yellow slide, a red steering wheel and metal bars for amateur gymnastics. And boy, did we put that thing to good use for the next decade or so! Last summer, my parents surprised the children with a gorgeous custom wooden swing set. The children were excited, but I was probably twice as thrilled. Watching that play set go up and knowing how many memories would be made on it was a delight to my heart as a Mama. I just knew it would ignite their imaginations and serve as the backdrop for endless backyard adventures for years to come. Despite ridiculously high expectations, we have not been disappointed! 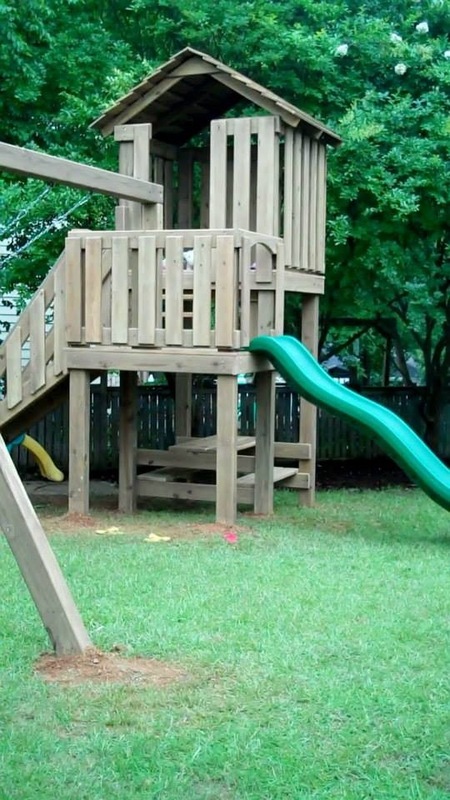 If you are thinking of purchasing a play set, I have to highly recommend Carolina Backyards. We particularly love our Skyscraper Play Set because it is very high and sturdy, and it has plenty of room for all three to swing at once. The slide is tall enough to interest older children and the roof over the tree house is fully covered to keep toys dry and safe. The picnic table beneath is perfect for kids, but large enough that I can comfortably sit as well. After over a year of play, I can tell you there is lots of fun to be had in our backyard. If a play set is out of your budget or won’t work in your yard, there are lots of great ideas for backyard fun to engage your little ones this fall. (Try searching Pinterest for “outdoor kid fun.”) Make a mud kitchen with old containers from the kitchen and a few plastic spoons. Build a pirate ship with discarded wooden pallets. Plant beans or sunflower seeds from the cupboard for an easy garden. Even something as simple as bringing art supplies outdoors can spark a child’s imagination. So as we enjoy this gorgeous October weather here in Columbia, get outside with your kids and enjoy some old-fashioned fun. This entry was posted in Activities, Family, Leah Prescott and tagged Carolina Backyards, Columbia, every woman blog, Famously Hot, Leah Prescott, lexington medical center., Midlands, playground, playing outside, South Carolina, swing set by lexingtonmedicalcenter. Bookmark the permalink.